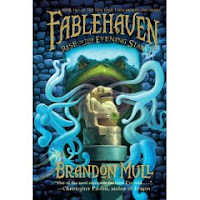 In the Rise of the Evening Star Seth and Kendra find themselves back at Fablehaven helping their grandparents find and protect a hidden artifact that is on the grounds. Their grandparents have brought three specialist, a potion master, a magical relics collector, and a mystical creature trapper, to Fablehaven to help, but can they trust them? I really enjoyed this book when in comparison to the first one. I loved how Kendra gained some confidence and I loved her new fairy powers. I was skeptical of Vanessa as soon as she wanted to share secrets. Seth in the cocoon and the "passing" was so gross and hilarious at the same time. So fun and cleaver! The last few chapters were very exciting and kept me turning the pages. It was a little reminiscent of the last few chapters of the first two Harry Potter books...lots of build up and then huge action at the very end. I'm very excited about this series and can't wait to keep reading the next couple books. I know that they won't disappoint. With each chapter and book that I read I am more and more positive they are perfect for their target audience.